My brother and I have been running for quite some time now and we’d like to make a shout out to one of our heroes, Beau Hodson. Beau Hodson runs his own website, http://www.integriousproject.com/. 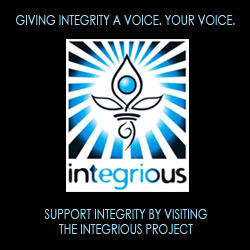 The Integrious Project is designed to bring the word integrious back into common usage. Currently, the word integrity has no adjective to describe someone and it is Beau’s mission to make integrious that word. Not only is Beau committed to making the word integrious a certified word in the dictionary, but he is also promoting the ideology behind the word. He is hoping to bring about a movement of people who act with integrity on a daily basis. The Running Brothers support Beau Hodson’s goal and we have been encouraging him every step of the way. If you are interested in finding out more about Beau Hodson and The Integrious Project, visit his website, http://www.integriousproject.com/. Doing some research for ethics and professionalism for ComSci and I went down a bit of a rabbit hole, but I feel that this would be a great word to have and apparently it was in use a long while ago, but for some reason came into disuse. Integrious FTW!